Sports communities in Second Life – A new satellite dish? With all my comments on needing to engage with virtual worlds and the olympics and the work I have done up to now with online sports representations is it really great to find an exemplar of a community driven collect of sports enthusiasts. Now there is a lot of passion and effort, plus community participation that goes into this, but when you think of the global budgets of the advertiser and sponsors of world sporting events this really is not very expensive! 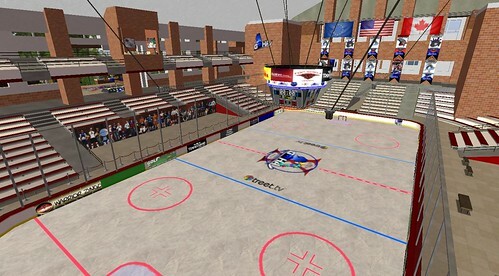 The same applied to Wimbledon in SL, which in reality I paid for the land and a few of us volunteered our time to build. It is the fact that people with an interest and a passion can get an awful lot done themselves. However think about how all this could be made even better with just a little attention from an interested party. For sports social media and virtual worlds need to enagage, for virtual worlds what could be more mainstream an example than sports? Much of the take up of Satellite TV in the UK was driven by people wanting to watch soccer. Can virtual worlds and online interaction be the new Satellite dish? Crowdsourced digital recreation of Olympics 2012? To explain the how and the why of this a bit more now the elevator pitch is done. The London 2012 olympics is a huge event that will be taking place in a world that is already heavily immersed in social media. People are already willing to take photos, share their experiences. A mass event like the Olympics will mean huge numbers of people sharing that experience from their mobile devices at the event. On the other hand we have an event that has lots of international politics around it, huge sponsorship deals to guarantee coverage and to also pay for the logistics of the event. We want 2012 to be the best games ever. However we are in a cash strapped world coming out of a major recession. One of the things I have majored on over the past few years is the recreation of sporting events (and other training events too) from data and descriptions of the event. This is in part a technical interest but also one where I know that sport is understood by most people, so representation of sport in new ways helps them understand things like virtual worlds, social media and games. I got to thinking that if the various bodies and rights management people controlling the Olympics flow of content and data have the whole thing locked down, negotiated and controlled but are not doing anything forward thinking now using the emerging technologies then we need another option. A crowdsourced and opensource approach may just be one that at least demonstrates the potential power of the crowd covering the event. 2012 a high percentage of people able to attend the olympics either on corporate tickets or paid for will have good mobile equipment, cameras etc. Network coverage will be good as it will be boosted for the event too. So there will be a vast amount of tweets, pictures, videos, streaming video, blog posts, facebook chat etc flowing in and around the events. That will of course not be as good as the TV company coverage but it will still have a great deal of potential. Taking some of those images, videos etc and utilising technology to work out which athlete is where, what event was this, and even motion capture the individuals at events using Project Natal (like) technology means we have a great deal of data available to digitally recreate the games in the public domain. Its the sort of approach Photosynth takes to recreate imagery from mass use of digital media. To feedback to the crowds with data driven augmented reality applications etc. It is a little way out, but it is not impossible and there is a lot of technical and social innovation that can occur in the next 2 years with web, mobile, virtual worlds and games. I think London 2012 needs a focussed and serious look at the things that can have a huge impact to the coverage and popularity of the games. The things I am considering here are homebrew ideas. They can be done very cheaply by anyone. Their is huge scope for something much greater to be done for very little extra cost and effort in the scheme of things by the powers that be. Capture, Analyse, Recreate, Share. Yes CARS for the olympics. Dear London 2012 Olympic people – Wakeup to Virtual! 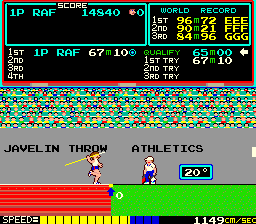 For a while a few of us have been pushing the odd button, making suggestions and plays to various people that London 2012 really should have a rich and ground breaking virtual component. It could, after all, be the cheapest, yet most far reaching impact on the games and the future of sport. Sport works in 3d, is rich in statistics, has global interest. Virtual worlds and social media fit very nicely into that space. What do we have for 2012 as a strategy? No idea, cant find one. Still at least 2012 can be shown the way by what the Singapore 2010 youth games are going to do. This article on Virtual Worlds News shows the bids and sums involved (including my old firm, who’d of think it 🙂 ) You can build a lot of virtual world experience using the available tools and $10 million. Look what we did with no funding and crowd sourcing for Wimbledon in Second Life ! My door/email/twitter/avatars are open to be approached, we are all happy to help. The country has the skills, in fact some people are world leaders in the field, we also have a thriving games industry.